Ezze Wear - Brand New Design, HoneyKomb and Corded Cotton Top with 3/4 Sleeves. Made in Canada. HoneyKomb Corded 3 Qtr Sleeve Shaped Blouse Top Shirt - HoneyKomb Corded 3/4 Sleeve Top is a fantastic combination of the carefree and "travel friendly" HoneyKomb Cotton and the slightly textured slimming Corded Cotton on the sides to create a style you will love to wear everywhere. The hem is a slightly curved, which makes for better coverage and if you choose, easy tucking. Full snaps down the front, and sassy 3/4 sleeves complete this wear-forever top. It can also be layered with a Tee underneath for cool evenings. Generous Sizing: S, M, L, XL, so you may want to order down. See details in Size Chart. 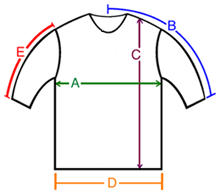 A: Chest / Bust circumference 38-39" 40-41" 47-48" 48-49"
B: Sleeve length from center of neck to end of sleeve 27" 27" 27" 27"
C: Body length from shoulder to bottom of hem 27.5" 27.5" 28" 28.5"
D: Hem circumference 41" 43" 50" 52"
E: Sleeve length from shoulder to end of sleeve 17.5" 18" 18" 18"